Los Angeles (June 6, 2018) – AXS TV—the exclusive U.S. broadcast home for New Japan Pro Wrestling (NJPW)—is giving away two pairs of floor tickets to this summer’s hottest wrestling event: NJPW’s G1 SPECIAL IN SAN FRANCISCO on Saturday, July 7 at the historic Cow Palace in Daly City, California. Visit http://www.axs.tv/njpw-g1-giveaway-sweepstakes-rules/ for official rules and complete details. 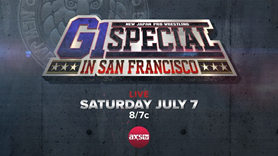 AXS TV will broadcast G1 SPECIAL IN SAN FRANCISCO live on Saturday, July 7 at 8pE/5pP. Wrestling Hall of Famer Jim Ross and former UFC Heavyweight Champion and NJPW veteran Josh Barnett will call the action ringside as “The Rainmaker” Kazuchika Okada, Kenny Omega, Tetsuya Naito, Hiroshi Tanahashi, and the rest of the stars of NJPW return to the United States for their biggest show yet. For more information on how to watch AXS TV visit axs.tv/subscribe. NO PURCHASE NECESSARY. Open to legal residents of the 48 contiguous United States plus D.C., age of majority or older. Void in AK, HI, PR, and where prohibited. Travel and lodging not included. Odds of winning will depend upon the total number of eligible entries received. There are two (2) prizes available to be won: Two (2) pairs of tickets to the NJPW G1 Special in San Francisco on July 7, 2018 (ARV $300 each). Sweepstakes ends 06/29/2018. For full official rules visit http://www.axs.tv/njpw-g1-giveaway-sweepstakes-rules/.